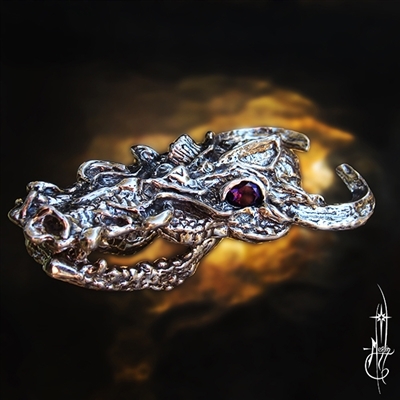 Amulets by Merlin presents the latest, largest Dragon Money Clip yet: The King Dragon Money Clip! This is the biggest one yet: three inches long with a deep set spring loaded jaw designed to hold a large wad of cash. Going much bigger would require a holster! The profile is low to slide into your pocket. Spring loaded jaw to open and close around your stack of cash. Spring Made in USA. Deep detailed carving of scales and stones for the eyes. Each one is made to order so if you want different stones, additional design changes (like your name or initials), I can do that: just email for more details on custom of this or any other of my work. To order your King Dragon Money Clip please visit my Money clip Page or go directly to the King Dragon Money Clip page.